Check out who’s going to be in town for a coaching session! It’s been a little while since I wrote a little something to keep everyone up-to-date on what’s going on around here. SO here goes! We’ve had a really busy fall so far, with Medal Ball, Food Drives, AMAZING AllStar Tournament Wins and a truly incredible Spotlight Night. This fall has been really fun, and things are just going to keep going forward! We’re really excited about everything coming up. While they’re all off in Las Vegas, we’ll be having a “killer” Halloween Costume Party, Friday October 28th! Yorkville will be joining us for this one, so it’s definitely going to be a “treat”! Get creative! As the holiday season approaches, we’re having our Christmas Star Ball on November 26th, at the Royal York Hotel. Not only will this be an amazing Pro Am event for our students, but our annual Christmas Party AND there will be a Professional Competition! There’s something for everyone, and I can’t wait to see you all there. Following this event, Daniel Heroux will be in the studio for private coaching sessions, he’s already getting booked, so get your spot ASAP! So that about covers it for now, stay tuned for move information on what’s coming up when and we’ll see you on the dancefloor!!! Click Here to Visit the Calendar online! Daniel Heroux & His Amazing Master Class (with pix)! 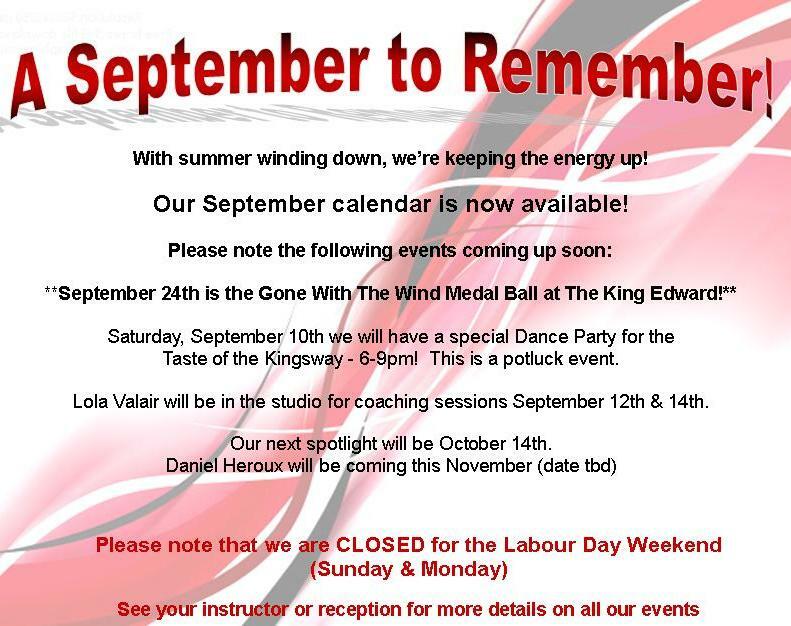 For this week though, we’re going to be heading to Arthur Murray Yorkville to join them for group and party, as well as taping by CBC! Should be amazing! I’m going to ask that some of my fav photographers grab a few shots, that’s be awesome! Well that was pretty Amazing! So, pretty awesome weekend, at least that’s what we think! THANK YOU to everyone who made this Sunday’s event at the Old Mill so great! I know, I’m gushing, but it was great! I’m going to try to get some pics up in the next couple days – so check back – Follow our RSS for easier notification of updates too! Now, how do YOU think we did? Pro Show? Great right?! So for this week, we have Daniel Heroux coming! Tuesday & Wednesday there are just a couple spots left, but he’ll be doing Private Coaching Lessons – these are SO worth it! He is a really wonderful coach – and a very nice man too – so let me/us know if you want to book a spot. Check back soon for some pics from Sunday! Daniel Heroux’s Coming to Town! Posted by Arthur Murray Etobicoke in Coaches Coming! What is a Coaching: In all sport related activities, a third pair of eyes is very important. At times, what feels good does not necessarily look good. A Traveling Consultant (coach) has years of experience and knows shortcuts for greater results. A coaching lesson can give the instructor a wealth of information that will give you a project for the next number of months. These concentrated lessons are geared not only to the experienced student—they are useful and productive for all students. While all dancing relates to posture and movement, footwork, timing and communication, a new student will be coached at a newer lever and an experienced student at a higher level. Bio: This dashing West Island resident first discovered the joy of ballroom dancing at age 12, he and his sister being the hottest pre-pubescent dance team this side of Pete Townshend’s hard drive. Later hitting it big on the competitive disco dance scene as one half of “Daniel and Johanne” in the ’70s, (“It was very much like Saturday Night Fever”), Daniel eventually went on to study ballet, was asked to tour with several companies, but ultimately chose to teach instead. He now owns an Arthur Murray Dance School franchise in DDO. When is he coming to Toronto?